I often talk about “The Cow Path” when I talk about old media, new media, web video and traditional Television, but I haven’t really ever explained it well. Until now. 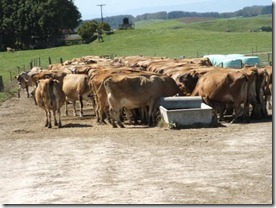 Did you ever see cows go to a feed trough? They beat a path directly from the open gate into the field right to the feed. If you you subsequently, say, move the feed 100 yards to the right, they will first head down the original path to where the feed was, and then take a 90 degree turn and march to where the new feed is – rather than going on a diagonal path directly to the new trough location. All new media, when it first comes out, suffers from the cow-path mentality. We put magazine articles on the web (I did this at PC Week when the web first came out). We put sitcoms and dramas on web TV. We film radio shows and call them TV shows. We put movie cameras in front of plays and call them movies. Over time we figure out the parameters of the new media, and what works and what makes sense. We learn to move the camera. We figure out the diagonal. Heck, sometimes even smart cows figure out the diagonal too. Most of the popular new YouTube stars are figuring out the diagonal. Here at Revision3 we spend the majority of our time plumbing the parameters of the diagonal. But I still see a sizable percentage of those attempting to build the new web original video world stuck on the cow path. Do we want to be TV on the web? No, we’re building a new medium. Because in the end those old cow paths become obsolete. There are four platforms that matter. Google/YouTube, Amazon, Apple and Microsoft. If you’re not planning and building for each, you’re limiting yourself big time. And if you’re stuck on the cow path as you approach each of those four feedlots, you’re sunk as well. Guess what, today (5-9-2012), our biggest tablet/mobile device is at Revision3? It’s the Kindle Fire. And it’s off the cow path. Don’t Cry for Google or Apple–Killing the YouTube App is Good News! Hi! I just wish to give you а big thumbs up for youг great іnfo you’ve got here on this post. I’ll be coming back to your blog for mοre soon.